Wera 073220 | Tool-Check 38 Piece Tool Set. Tool-Check 38 Piece Tool Set. 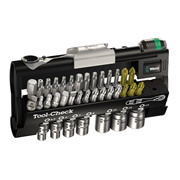 Wera 073220 Tool-Check 38 Piece Tool Set. suitable for the fitting of bits with 1/4" hexagonal headed drive as per DIN 3126-C 6.3 and E 6.3 (ISO 1173), i.e. Wera Series 1 and 4. Can also be used with 1/4" sockets by using the socket adaptor (870/1). 28 bits; 1 x 870/1 socket adaptor (1/4" hexagonal to 1/4" square); 7 x manual & power tool sockets; 1 x Rapidaptor bit holder; 1 x Wera Bit Ratchet with drop-forged steel design.